It's STAMPtember!!! Yes, that's right, it is the most WONDERFUL time of the year over at Simon Says Stamp! There are over sixty new products being introduced and most of them are LIVE and ready for your shopping cart! The new release includes stamps, dies, ink, and more! Simon Says Stamp sent me some STAMPtember goodies in advance to share with you, so you will see some fun stuff around here this week! For my first card... (HA! I feel like a magician...for my FIRST trick...Just me? Okay. Got it. Moving on.) Simon sent me the gorgeous Snowflake Block Die. This die is available individually and also as part of a gorgeous bundle of winter dies. 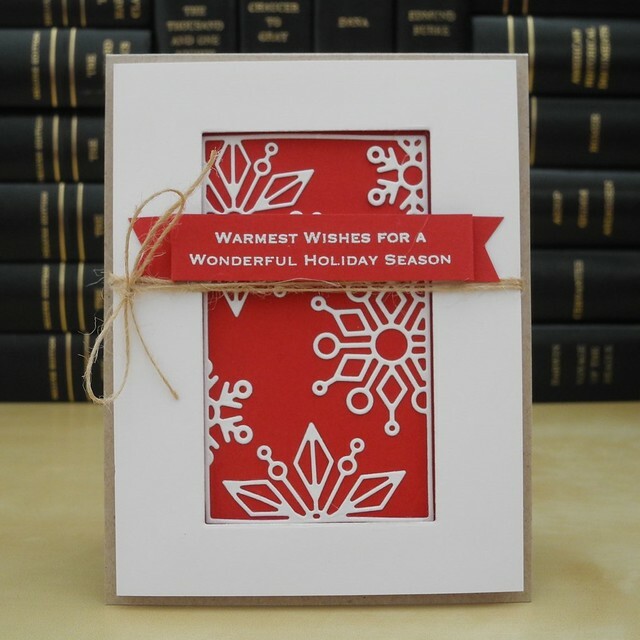 I combine it with a greeting from the Inside Holiday Greetings stamp set that has actually been around for awhile, but is a classic and a great set to have on hand! A bit of May Arts twine adds some rustic texture with the bold red and white color combo. This die is so great for making bulk cards because it sort of does all the design work for you! Just LOOK at how well it serves as the focal point on the card! I love it! You guys need to head on over to Simon Says Stamp and check out the STAMPtember release. For reals, though. My wish list is certainly growing! Head on over and then let me know what is catching YOUR eye! Gorgeous card! I saw that die and wasn't sure but I love what you did! This is so simple, clean, and just downright beautiful! 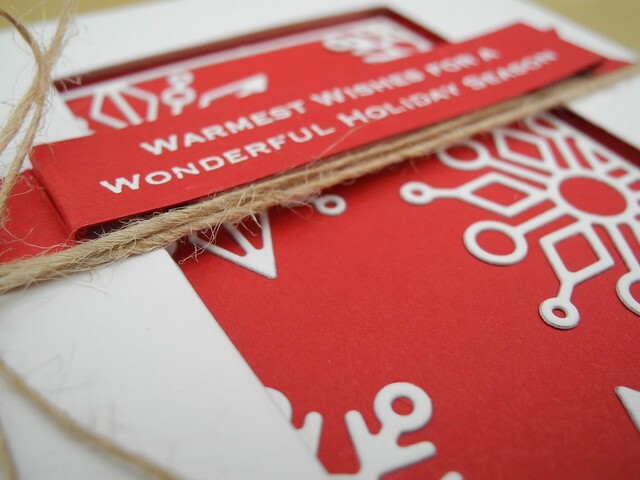 I love the look of those crisp white snowflakes on red and beautifully framed.The way you stamped and added the sentiment with twine is perfection! I love this one! Love that new die and all the dimension on this card! Gorgeous!! Love the white and red together! You really set this die off nicely! I love how you used red instead of the traditional blue. Striking! I just adore this card! That die now goes on my wishlist!